Water filled barriers are increasingly becoming the barrier of choice over conventional devices for providing added safety to work zone areas. It is a very versatile product which great durability. No sandbags are needed and deployment is easy. Additionally, they are very portable and provide excellent visibility because of their brighter color. They require less maintenance than more traditional installed work zone devices and help clearly delineate the entrances and exits for travel through the traffic work zone. An interesting fact is that when it comes to construction road safety, statistics show that four out of five people killed in construction zone deaths are the driver of the vehicle or their passengers and NOT the construction worker*. Over the years, most of the safety concerns have been placed on protecting construction crew and very little focus has been place on the protection of drivers and their passengers. As a result, many sites still use concrete barriers in these traffic construction zones. Unfortunately, fatalities and serious injuries have been shown to be higher for concrete barriers. Water filled barriers can be a much better choice that helps keep everyone safer. 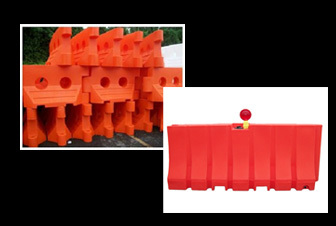 https://blog.trafficsafetywarehouse.com/wp-content/uploads/2013/04/water-barriers.jpg 226 336 TrafficAdm1n73 https://blog.trafficsafetywarehouse.com/wp-content/uploads/2016/10/traffic-safety-products-info.jpg TrafficAdm1n732013-04-16 02:18:052016-09-26 15:32:20Why Water Filled Barriers?